What is The High Vacuum Coating Machine? 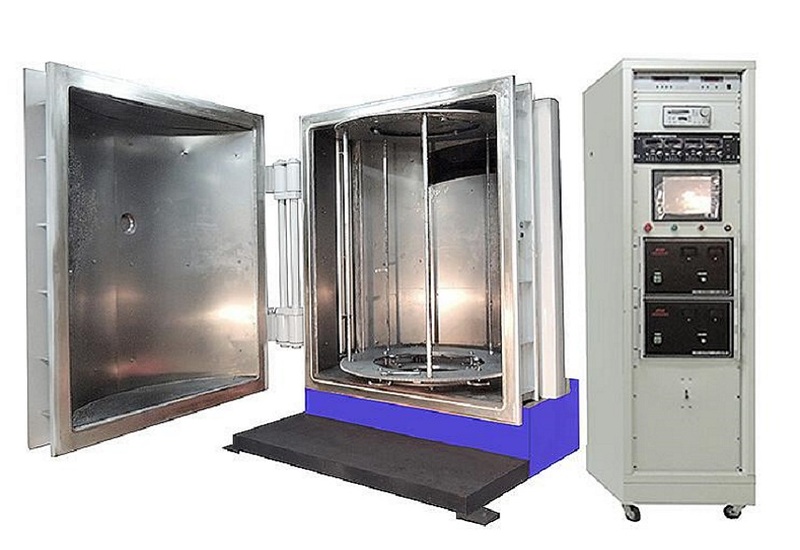 According to the different requirements of the processed products, the size of the vacuum chamber is different. The most widely used chamber diameters are 1.3m, 0.9m, 1.5m, 1.8m, etc. The chamber cavity is made of stainless steel, which is hard and rustless. Each part of the chamber has a connecting valve for connecting the various pumping pumps. 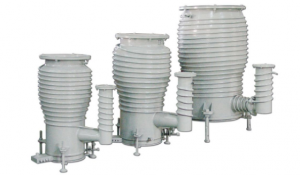 The exhausting process is as follows: the mechanical pump first draws the vacuum chamber to a low vacuum state of less than about 2.0*10-2PA, which provides a precondition for the subsequent pumping of the diffusion pump. Then, when the diffusion pump draws the vacuum chamber, the mechanical pump cooperates with the oil to diffuse. The pumps are connected in series. The exhaust system is an important part of the vacuum system of the coating machine. It mainly consists of three parts: mechanical pump, booster pump (mainly introduced Roots pump) and oil diffusion pump. The mechanical pump is the most widely used low-vacuum pump. 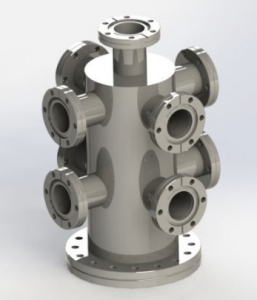 It uses oil to maintain the sealing effect and relies on mechanical methods to continuously change the volume of the suction cavity in the pump. The volume of the gas expands continuously to achieve a vacuum state. The booster pump, also known as the Roots pump, is a mechanical pump with a pair of synchronous high-speed rotating double-lobed or multi-lobed rotors. Since it works in the same way as a Roots blower, it can also be called a Roots vacuum pump. The pump has a large pumping speed in the range of 100-1 Pa pressure. This pump can’t work in the air, its function is only to increase the pressure difference between the air inlet and the exhaust port, and the rest requires a mechanical pump to complete. Therefore, it must be used with a mechanical pump. The ultimate vacuum of a mechanical pump is only 10-2 Pa. When it reaches 10-1 Pa, the actual pumping speed is only 1/10 of the theoretical value. If one wants to achieve a high vacuum, an oil diffusion pump must be used. The structural form of vacuum pipes and static sealing parts (flanges, seals, etc.) in the equipment shall comply with the provisions of GB/T6070. 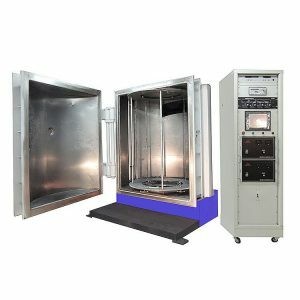 Vacuum measurement gauges shall be installed on the vacuum and high vacuum pipelines and on the vacuum coating chamber to measure the vacuum of each part. When an electric field is found to interfere with the measurement, an electric field shielding device should be installed at the measurement port. If the main pump used in the equipment is a diffusion pump, an oil-steam trap should be installed on the inlet side of the pump. The coating chamber of the equipment shall be provided with an observation window and a baffle device shall be provided. The observation window should be able to observe the working conditions of the deposition source and other key parts. The design of the ion plating deposition source should increase the ionization rate in the coating process as much as possible, improve the utilization rate of the coating material, reasonably match the power of the deposition source, and reasonably arrange the position of the deposition source in the vacuum chamber body. Arrange the heating device reasonably. The general heater structure layout should make the temperature rise of the workpiece to be plated uniform. The workpiece holder should be insulated from the vacuum chamber body. The design of the workpiece holder should make the film layer uniform. The ion plating equipment should generally have a workpiece negative bias and an ion bombardment power supply. The ion bombardment power supply should have a suppression of abnormal discharge devices and maintain stable operation. Others Compressed air, liquid nitrogen, cold water and hot water required for equipment. The transpiration coating is usually heating the evaporation pellets to transpire the surface components in atomic or ionic manner. It is then deposited on the substrate to form a film. As for the sputtering coating, during the process, the electrons or high-energy lasers are used to bombard the target material, and the surface components are sputtered by an atomic group or ion, and finally deposited on the surface of the substrate to form a film. The vacuum coating machine adopts box-type structure, and the vacuum system is rear-mounted. The operation and maintenance are easy. The surface of the whole machine is flat and easy to clean. The vacuum system of the vacuum coating machine has the advantages of large pumping speed, short pumping time, high vacuum and short production cycle. The workpiece is rotated by the upper center. The bearing is water-cooled and the magnetic fluid is sealed. The rotation is stable and reliable. The vacuum coating machine adopts advanced coating control system, the operation interface is beautiful and practical, the system is stable and reliable, and the system can be operated manually, semi-automatically and fully automatically. Stanford Advanced Materials (SAM) Corporation is a global supplier of various sputtering targets that promise the high-quality film. Please visit https://www.sputtertargets.net/ for more information.